Meon Valley Marriott Hotel & Country Club has something special to offer for golfers at all levels. Set amidst 225 acres of rolling countryside in the heart of Hampshire our 27 hole golf venue is the perfect setting for your next round of golf with friends, colleagues or clients as we come into the Winter and Spring months. The 18 hole par 71 Championship Meon Course cuts through an English oak forest, offering tree-lined fairways, large bunkers and natural water hazards. The 9 hole par 35 Valley Course offers wider fairways than the Meon course. The Valley Course is slightly less challenging but has its own unique charm. Built around the ruins of an ancient Roman village, the 9 hole course can be played as one 18-hole course at 5,758 yards with a par 70. Our state of the art golf academy enables you to perfect your swing and features a computerised teaching system that combines motion analysis with pro instruction. Our PGA professionals take time with each student to ensure they receive the most from each session. We have extensive practice areas, including chipping and putting greens and an 11-bay covered driving range. Bring your clubs, rent our top-brand equipment or browse our pro shop for the latest tournament quality products. 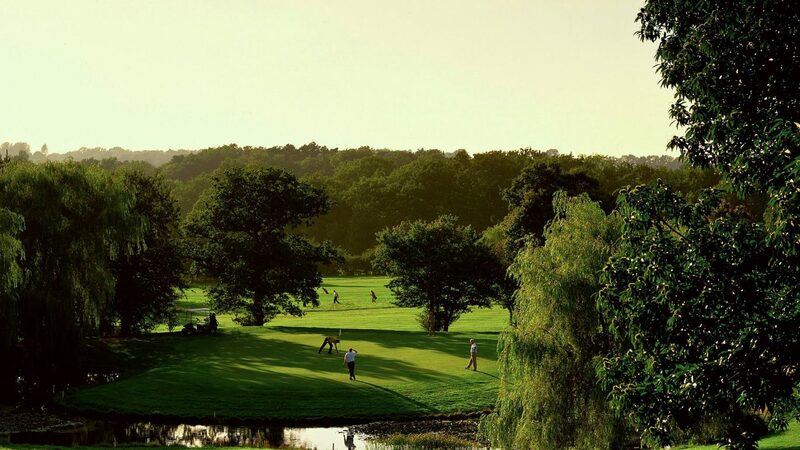 Whether you are looking to become a member, thinking of your next corporate event or looking for a quick round of golf with friends, Meon Valley will truly not disappoint. 18, 27 and 36 hole packages available with breakfast, lunch and evening dining options, freshly prepared by our on-site chef. Winter season November to February. Packages start from £50pp. Summer season March to October. Packages start from £55pp. We are always happy to discuss tailored requirements to suit individual requirements. From the road we are easily accessible via the M27, M3 and A3.Equidistance from Portsmouth, Southampton and Winchester. By rail direct connection to London just 75 miles away. Nearest main line station is Southampton Parkway just 15 minutes away. Find ample free parking on-site. Please call the hotel directly for the best green fees – 01329 836836. 113 luxury appointed rooms with Wi-Fi, laptop safe, TV entertainment plus tea & coffee making facilities. A warm and inviting atmosphere awaits you in our Zest Restaurant & Bar. Offering Starbucks Coffee and an extensive menu throughout the day and night. Our 2 gyms offering state of the art fitness equipment for cardio vascular and free weights work outs. Pamper yourself in our Retreat Spa. Using Decleor and Carita products we offer a wide selection of facial and body treatments.